Italian charm bracelets are fun accessories that can tell the world about your personal style and interests. You can buy these bracelets premade, but it's also fun to make your own with charms you choose and purchase individually. The process of making your own bracelet is simple. You won't need any special tools. All you need is a selection of Italian charms. Choose the perfect charms for your personality, and get started. Italian charms that represent your interests. Pugster - This site has more than 13,000 different Italian charms, including ones featuring photographs, custom engraving, dangles, and more. Prices start at around $1.00 per charm. Heavenly Treasures - Offering Zoppini Italian charms in dozens of different styles, this is another great source. You'll find letter charms, birthstones, cartoon characters, and more. Prices are quite a bit higher, starting at $25.00 each. Affordable Charms - Here, you'll find an incredible variety of Italians to charms. Prices start at about $5.00. ItalianCharms.com - Specializing in Italian charm bracelets and links, this site offers custom etched charms and lots of pre-set designs. Links start at around $6.00 each, and there are more than 10,000 designs. Once you've selected and purchased the charms you need, spread them out on a level work surface with good light. Pick up two charms, holding one in each hand. They should be face-up. Slide the front of one charm to the left, opening it up. 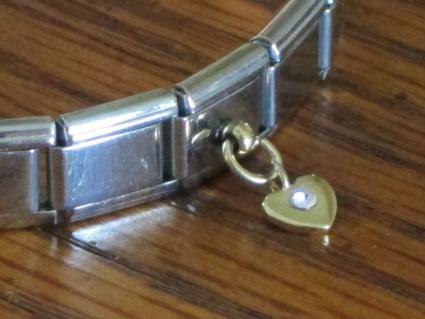 Place the hooked end of the charm into the loop on the charm in your other hand. You may need to wiggle or angle the charm slightly to get it to attach. Allow the charm to slide closed, linking the two pieces together. Repeat with the remaining links until you have a bracelet of the desired size. Place a cookie sheet with raised sides on your work surface and line it with a dish towel. This will help you avoid dropping charms on the floor, where they may be damaged or lost. If you're having trouble separating the charms by hand, you can use the Italian charm tool designed to make the process easier. These retail for about $2.00 on Amazon.com. When deciding on the number of charms for your bracelet, go up one size if you're between sizes. That way, your bracelet may be slightly loose, but it will be comfortable. If you're not sure which charms to choose, select charms that represent a period of time in your life, an interest you love, places you've traveled, or other themes. Having a unified idea behind your bracelet can make it more fun. If you're making this Italian charm bracelet as a gift, consider going up one size. The recipient can always take out a link if the bracelet is too large. Italian charm bracelets are easy to make, and they are a great way to show off your personality to the world. Take your time choosing links and assembling your bracelet, and you'll have a favorite piece of jewelry you'll be proud to wear for years to come.